A pleasant Saturday afternoon in late April was spent exploring the environs of Knocklayd. We travelled into the centre of Ballycastle to the Diamond.Up Fairhill Street to the car park and then on foot further up Fairhill Street. We crossed a gate marked 'No Dogs' and the field led us to another track through Ballycastle Forest. There is a longer route if you follow the signs for Moyle Way from the car park. 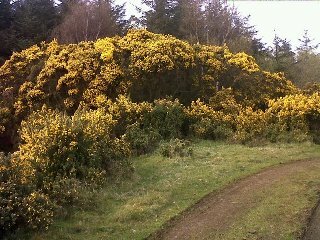 We saw some of the best gorse (locally known as 'whin') displays we've ever seen. Some of those bushes were 12 or 13 feet high. Seems the regular gorse arsonists have avoided this place for a while. There is a path to the left of the track crossing a gate which leads to the summit. A steep climb following the fence. About half way up the climb levels off. Ground is very uneven - good cover for grouse of which we caught a view. Next you come to a sheep fence which has a stile. The summit is a mound ( (Carn-na-Truagha or Heap of Sorrows) topped with a trig point. The views from the top are superb - Rathlin and Islay to the north, the Kintyre Hills to the east, Slieve Snagt on Inishowen to the west. On the way back we watched buzzards and ravens jockey for position in the skies. When she last touched her canvas and painted Knocklayd.